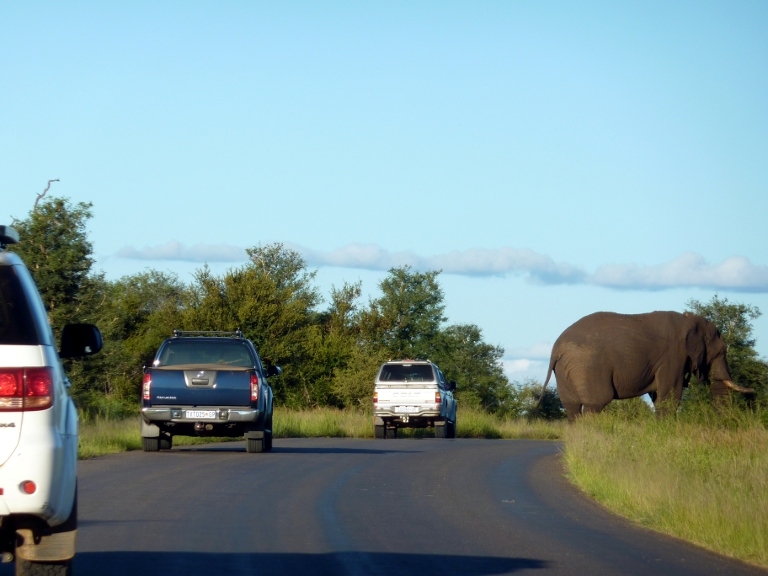 Lower Sabie camp only to startle a big bull along side of the road. He wasted no time in showing his displeasure of our presence. 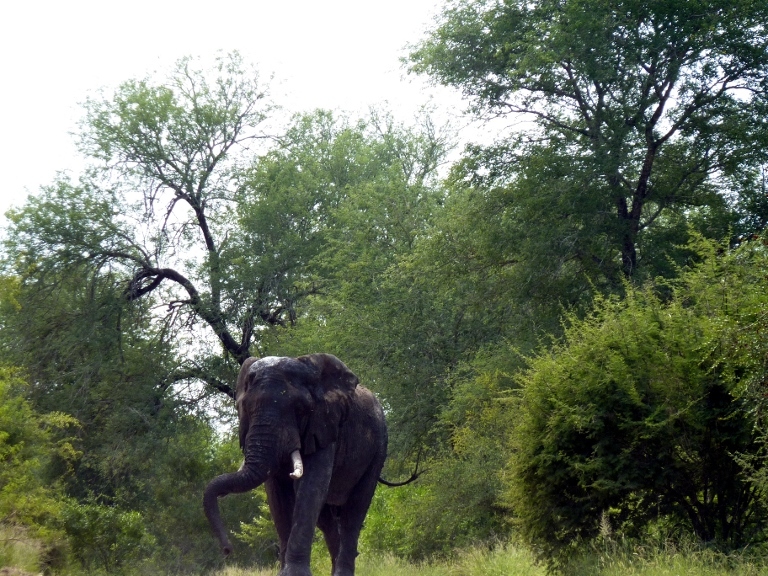 He came moving swiftly toward the car, ears flapping and trunk swinging. It was all Ann could do to not jump out of her skin and drive pronto, in reverse, back around the curve and up the hill. It is said in the park that this aggressive behavior could be an intoxication effect from the elephant eating too many marula fruit. 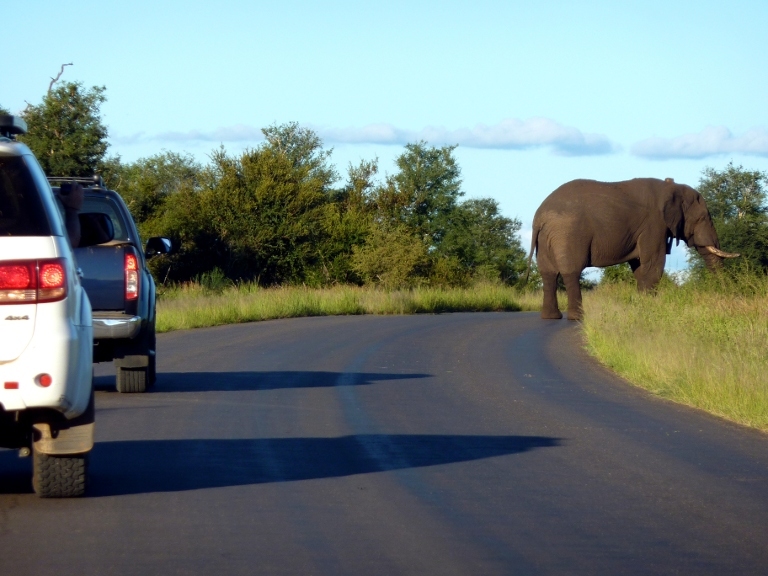 Great…drunk elephants on the road! service after the gates close, we saw an incredible lion drama develop on the plains and banks of the lower Sabie River just outside the Lower Sabie camp. It was described by the ranger as a once in a lifetime occurrence. This phrase is heard often in the park as well as “you were lucky”. The ranger on the drive spotted 7 lions taking in the last golden rays of the sun on a huge outcropping of rocks just across the river about 100 yards from us. It was a scene that could have been painted and hung across the river. From our vantage point we could see for miles up and down the river and out into the plains. The plains gently slopped down to the river on both sides with pockets of thorn trees and bushes with rock outcropping here and there and the one were the 7 lions lounging on the cliff. As everyone was sighing with exhilaration, the ranger announces “ Get ready the drama is about to begin”. Two buffalo were grazing up the river toward the lions. A couple of the lions just happened to be facing in their direction. This was so unbelievable that it seemed like we had to be watching this African animal drama in a super huge IMAX theater. As the buffalo got within about 200 yards the lions that were lying down were now up and all were intently looking in the direction of the buffalos. The ranger started explaining the hunting strategy of lions and no sooner than when she was done the lions jumped off the cliff and slowly walked single file toward the unsuspecting buffalos. When the lions were within a few hundred feet, the lions broke out of the single file and started to circle the buffalos in a slow stalking one-leg-at-a-time fashion. One buffalo was in some thick bush and it looked like a goner with a lion right one the other side of the thicket. There was a short scuffle between one lion and the buffalo, who had his head lowered to the ground and wailing about and then he decided to high tail it over to the other buffalo who had secured a bit of high ground. They both faced the lions with horns slightly lowered and stared down the seven lions who at this point seemed no longer interested. The ranger said at this time that lions are lousy hunters with a only 9 % success rate, they have good strategies but poor execution. The buffalo are one of the most feared animals by lions and humans. The lions moved on single file down the river and what is down the river unknowing to the lions, a giraffe. Giraffes who have excellent eyesight that is further enhanced by their observation tower necks are keen to any thing approaching. This giraffe was on alert quickly before the lions knew of its presence, and stood still and watched the approaching lions. The lions caught wind of the giraffe and started to break out of their single file toward the giraffe. The giraffe was ready and slowly trotted further out into the plains out of range for the lions to start stalking. The lions continued toward giraffe and the giraffe trotted again before they could stalk. The lions lost interest and the sun set. Drama over. Cat sightings are infrequent and cats on the hunt are more so. 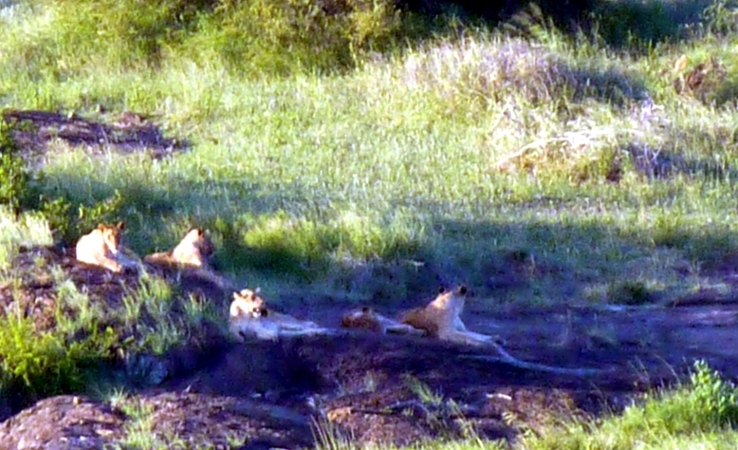 Our first lion sighting was on a sunset drive outside the Berg en Dal camp. It was dark on a remote road when four young male lions walked out of the bush in front and along side our safari truck. They strolled along for several minutes before they disappeared into the bush. This is more typical of a lion sighting. Our only other sighting was on a sunrise drive outside the Satara camp when we came upon a pride in a field watching the sunrise only to be disturbed and driven away by a solitary hyena. The lower Sabie camp was the most unique of the 4 camps we stayed for it had a restaurant deck over the banks of the Lower Sabie river where hippos and elephants roamed. It also was unique for a roadside lake that was a kilometer or so from the camp that was loaded with crocodiles and hippos. 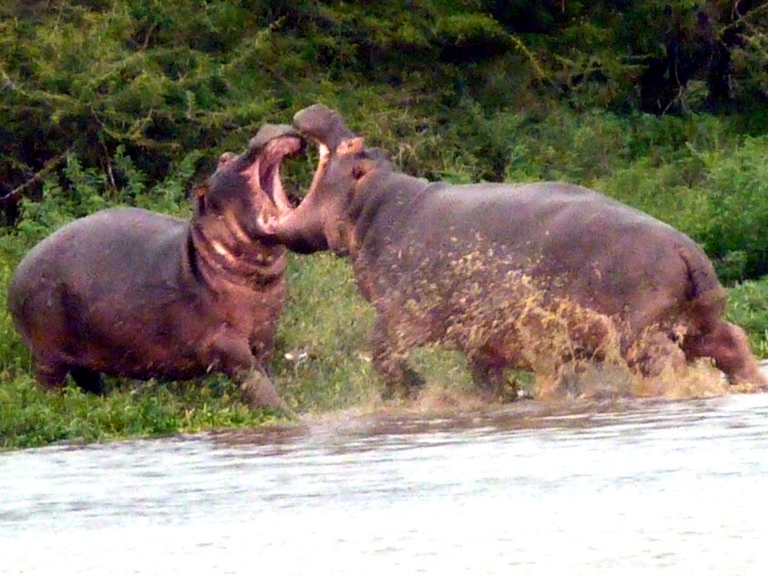 We parked at the lake from and to the camp everyday and watched hippos fighting, grazing and in groups thrashing about in the water submerging and reappearing. We did not think we would see so many animals and so often. We saw four of the big 5 after our second day of a 14 day stay. On the 14th day we still did not see the last of the big five, the leopard. We were not disappointed for we had many sightings and adventures that we would never forget. How could we forget watching a group of 30 to 40 baboons come down the road toward us with their young ones bouncing around playing in the road and as they get to our car all the young ones jump up onto the car and pounce and roll around with each other all over the car. Pure monkey business. Or on our first day, while taking a turn in a road , we come up behind a pickup truck stopped up the road by a big bull rhinoceros standing sideways across the road displaying his maleness aggressively and then deciding we were not going to intrude on his territory. He outdid our patience by laying across the road. When we turned around to head back , we were approached by a hyena coming down the road that stopped for a sniff of our car before continuing down the road. Those hyenas are bigger than I thought. Also the horrific sight of a python coiled around a suffocating impala showed that the realities of animal survival are not always pretty. Or the spending of a few hours quietly following a big male zudo that was slowly grazing parallel to the road up in a thinly treed forest and finally being rewarded with him coming out of the trees and crossing the road in front of us displaying his long twisted horns. On the fourteenth day while watching some klipspringers, a safari guide pulled up next to us to ask of any sightings. He mentioned that a leopard was 7 kilometers up the road with a impala carcass in a tree. When we got to the tree, about 30 feet from the road with other trees and thicket covering most of the tree‘s view, the cat was gone. Another safari guide parked along the road was waiting for its return, so we decided to also. About 30 minutes of waiting the leopard was spotted on the ground by the guide and he maneuvered his vehicle for a better viewing of the carcass branch of the tree and we maneuvered into the spot he was in. The cat never went to the carcass but decided to sleep in a lower crevice in the tree. We had the only spot that offered any viewing of cat, and it was only of the cat’s back. Everyone left including the cat a short time later. We stayed hoping for a return of the cat. It never happened and we left and returned 2 more times we no luck. We decided if the cat keeps coming and going, maybe it would return tomorrow. We decided on our last day to be the first one at the tree. 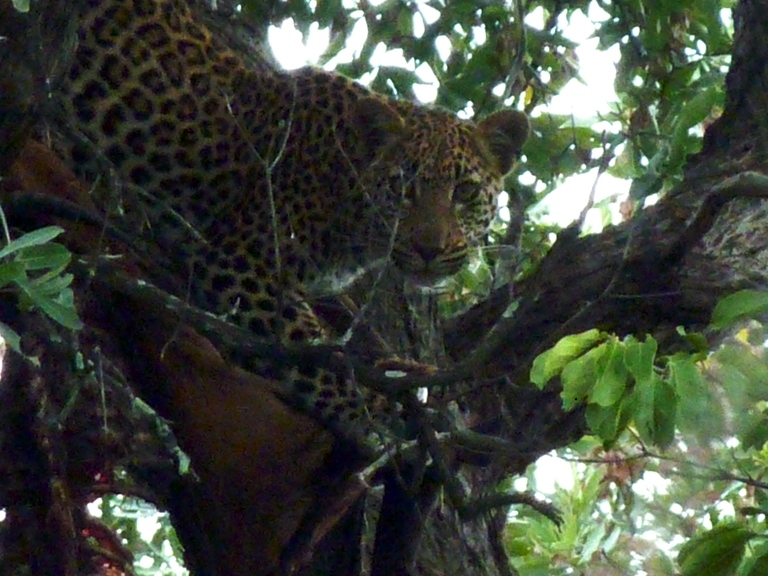 The next day we went out to spot at the tree, no one was there and viola, a leopard was up in the tree at the carcass. Before we pulled over to the only good spot for viewing the carcass we noticed another leopard laying on the ground. The grass was high and we could just make out it was a leopard. It was have been the other leopard’s young one. Almost every female animal in the park had a offspring following it. We pulled over to the best viewing spot and watched for 45 minutes of the two leopards going up and down the tree feeding on the impala carcass. Soon the word got out about the leopard and a mini traffic jam occurred with about 8 to 10 cars. We watched about 2 more hours, as the cats would leave then come back. After the cat’s last long absence we left, returning back later in the day with no cat and no cars. We decided that before we drove out of park the next day to our next destination that we would check the tree again first thing in the morning. The next morning there was no leopard and the carcass was gone. It looked like there never had been a leopard there. We drove on to leave the park. On the way, we spotted a car stopping and going and a occasional head popping out the window with binoculars. The car turned onto a watering hole road with a couple cars following. A potential sighting in the making. We followed in to inquire and found out that there was a leopard in the area. The binocular car looked around at the watering hole and left as did the other cars. We decided we would put an hour in at the watering hole waiting that maybe the cat would get thirsty. After sweating in the morning heat sitting in the quiet car we decided to pull out and get going to our White River destination. As we turning the car out from the watering hole onto the road out of the thicket, I saw a bright golden light on a distant tree branch and was not sure if it could be something else. We maneuvered our car the best we could between the tall grasses and the bush thicket and still could not tell if the golden light on the branch was just sunshine until there was movement. The leopard got up and circled on the branch and laid back down like house cats do. We watch for the next 2 hours as the cat tried to get comfortable on that tree branch. Within 30 minutes the cars came. Usually with off road sightings there are only one or two viewing positions because of the bush. The discoverer of the sighting gets the best positioning and sometimes it’s the only view, which was the case with this sighting and the previous one. It is important to wait because things happen quickly and are over very quickly. Everyone understands having the “luck of the draw” in animal sightings. One day out of the Berg en Dal camp, we came upon a road jam of about 10 vehicles . As we crept our way through the jam we were able to see a Python coiling around an impala in an opening between two bushes along the side of the road. The jam lasted all day for the Python never left. 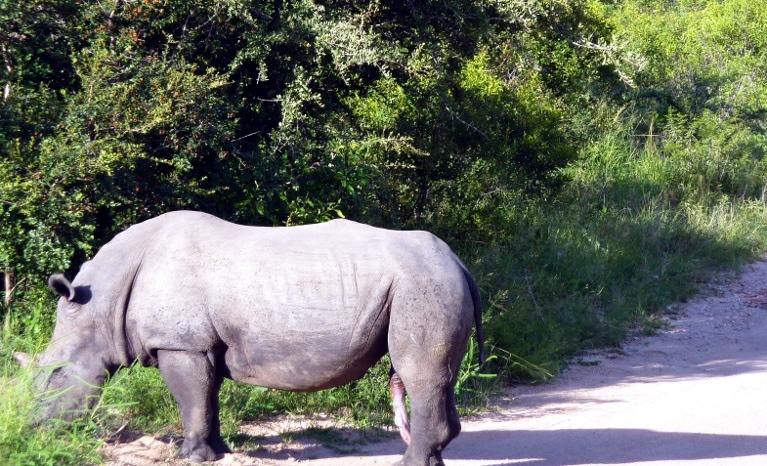 Most sightings can only last 5 to 15 minutes as the animals come out of the bush then go back in. it’s a skill that develops in KNP to drive around looking out between tree and bushes above the tall grassed to spot movement or parts of animals. As one ranger apologized on a sunset drive after she stopped the safari truck that usually indicates a sighting, that it was nothing, that sometimes the animals turn into bushes. We saw many animals turn into bushes but none as exciting as the tree branch that turned into a leopard. I love watching nature shows on television, and have seen many about Africa over the years, but . . .electrified fences? Five minutes to spare? Drunken elephants coming at me? My trousers would be permanently brown! John, I love the animal TV shows also. KNP was just unbelievable. We decided we will go back again sometime. The strange thing about the animals is I think they are use to the cars driving around them and they do not get too concerned about them unless it is in their space, just like humans. But I got out of the car once with a herd of grazing Zebras that were what I thought far enough away and they perked up real quick and I had their full attention. Guides told us that you could not last 5 minutes out in the park without protection. You just have to use common sense. Ann and George, I was in Africa twice in the 1970s. Once we were able to get out of the cities the wildness was omnipresent. So go for all of the trips outside the fences if you can! We slept in huts within view of Kilimanjaro, went to sleep with lions roaring in the distance and were awakened by elephants stolling through the camp. I said huts, not tents! We were riding through the park outide of Nairobi, dirt roads, and the teacher who was driving hit the gas and started chasing ostriches. Spending quiet time with local people was very rewarding and unforgetable. The U.S. doesn’t really amount to a hill of beans over there and the so-called “white jeep” diplomacy may or may not accomplish what the Not-for-profits set out to do. Africa is not a poster-child, it is the ultimate challenge for civilization. Talk about roots . . . .
You guys are very lucky and will have to host a slide show. Bill you never told me about your Africa trip. I wish you did instead of hitting those silly tennis balls. We ditched out of a trip to the Serengeti because of the Somalia pirates lurking off shore. We just love South Africa and we plan to spend another winter here in the future. Everyone here says South Africa is not Africa. I say to them it is not American either.